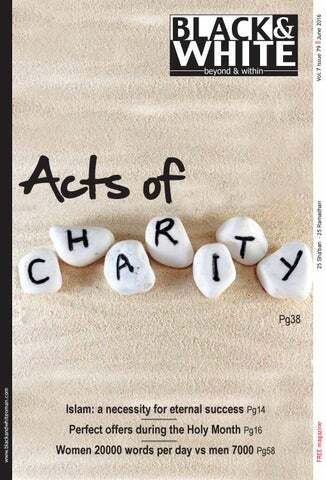 of kindness 38 Acts It is the month of giving. It is the month when the faithful make enormous effort to fulfill one of the most important task of their lives â&#x20AC;&#x201C; to give and not just to give, but to make a great effort to put a smile on the face of the less fortunate. And, it is the month where the less fortunate have a reason to smile. Charity during the holy month of Ramadhan takes on a whole new meaning and it really brings food to the table of even the most impoverished. There is always a noticeable increase in charitable work during Ramadhan. The best part of Ramadhan is that during this holy period, there is a great increase in charity-related acts. Other than the corporate social programmes of companies, we see a great push by the charity organisations in Oman. The Holy Month of Ramadhan where the hotels, malls, supermarkets, vehicle outlets and almost any shop that keeps its doors open will have an offer - just to commemorate this spiritual season. men spins a 12 Moody web of negativity When men get moody, their women are in a fix not knowing what to do, especially when they are on a longtime emotional rollercoaster. If we dust off an old statistic, we might discover some gems like this, which states that women speak around 20,000 words a day as compared to men who are able to utter only a mere 7000. Which means that there is a wide gap of 13,000 words between a man and a woman and it is doubtful if men are ever going to leap over the chasm. about a million years! Let’s start a pay-it-forward campaign? By Adarsh Madhavan I don’t know how to start it. I am not even good at starting a conversation, so I can’t imagine myself to be good at starting a campaign. But, today, let me forget my differences with myself and try to make a genuine attempt at this as we slowly enter a season of giving, of charity, of compassion, of prayers and piety… First, let me start by writing about it. Let me pen these points in print. Let that be the preamble to this movement as such. The ‘pay-it-forward’ movement. Let me start by making a simple gesture. The simplest of simple gestures: so there is this man trying to feed two 25 baisa coins into the parking meter at a parking point outside a bank without much success. He is dripping from head to toe as the sweltering sun beats down on his bald pate as he unsuccessfully tries to push the coins in. So, I, the epitome of all kindheartedness, jump down from my high seated vehicle, fish into my garbageridden side pocket, my fingers stumble on a round 50 baisa coin and I grab it hard, yank it out and then plonk myself before the parking contraption and suggests to the middle-aged man, “May I?” The coin goes in and the printed matter is spat out and I produce it for him with as much as flourish as I would if I were giving him the winning lottery ticket! Moody men spins a web of negativity QUESTION TO THE THERAPIST: My husband is a very moody person and I often wonder why he is always down and out. Lately, this has reached to a head as he is very moody and is also on a real complaining spree. Forget the fact that he comes home grumpy and is bad with me, the worst is when he is bad with my children, which I clearly cannot tolerate. What should I do? ANSWER: All this while, women took the rap for being the moody type. But, what we have to realise is that guys also have pretty bad mood swings. And the problem is that they act totally differently. If it is a woman, she would spill it all out and we would know for sure where she was and where she is going with her moods. But not so the men, who tend to keep his moody self under wraps and unleashing it in a mysterious peel by peel manner, which leave us totally confused. TWO TYPES Two things: moody men are of two types: The first one has had a bad day and he is reacting to what happened at work, at play or the fact that his team has lost a match. But, the second is the type who is on an emotional rollercoaster several times in a week. you let your sensitivity rule you throughout, you may find it hard to live in a hard and tough world. Both versions mentioned above are easy ways out of a simple problem. But then the real problem is when you are living with a totally negative person. If he is experiencing depression, then he may need to go on a different line altogether. Don’t rule it out and if the problem persists do consult a psychiatrist. Or at least ask him to take a depression test. DEAR HUSBAND… Ask your man to read this as I want to address these lines to him personally: Dear husband, I think the most important thing in your life is your family (your children and wife and other loved ones). So, I am sure you would not want to hurt them or make them unhappy. Your mood swings or your habitual moody self is hurting them, affecting their lives. Being habitually negative makes everyone around you miserable and it really has a toxic effect on all of those who love you and depend on you. When you have a problem, please try to share it with your loved ones because they care; and if they can’t handle it, find someone who can. There will always be someone who can. If you need medical help, try for it. None of us should be blind to our shortcomings. What you need to do is to change your internal attitude. If you realise one key issue is that until and unless you get internal issues right, nothing will work. When nothing is right on the inside, then nothing will be right on the outside. So, work on it. Find out why you have such a huge negative attitude to everything and work on it; change it to a positive one. That is the first step and everything is going to change for you once you take this step. Good luck! Smile! you do with the knowledge you had. Based on these simplistic Islamic fundamentals, Islam is able to tie up the affairs in this life in a manner that matches the requirements for success in the life hereafter. With this comes the necessity to understand Islamic linkage of both lives and the need to be resilient to adopt and overcome challenges - knowing for sure that this life is a short one that we will indeed leave one day (when the appointed time comes) and that we will be held accountable in front of our Almighty Creator, Almighty Allah, for all the actions we did or failed to do. Hotels offer perfect ambience during the Holy Month The Holy Month of Ramadhan ushers in a month of blessings and generosity. Hotels in Muscat have created the perfect ambience to ensure that the spirit of Ramadhan pervades throughout their premises from sunrise to sunset. As the sun sets every evening during this Holy Month many faithfuls will explore new venues and different options to break their fast. Ramadhan is indeed that spiritual time of the year which blends with the mild celebratory ambience where the evenings fill up with get togethers among family and friends. The beauty of the Holy Month is that apart from the deep spiritual element, there is a warm and sharing mood that is manifest from sundown. Ramadhan is not just the holiest month for the Muslims, it is also one of the happiest. And it offers families to spend time together, which again is spiritually uplifting. And Iftar is the perfect way to celebrate the deep bonds of friendship and love amongst loved ones. Traditionally, families break their fast at home but most people are also looking at other options to break the fast and that is where hotels and restaurants come in with their delightful delicacies and perfect surroundings. Here in Oman, the hotels and restaurants are providing grand occasions to break their fast, as well as savour the delectable delicacies. hand throughout the summer to entertain the little ones, with activities such as henna painting, arts and craft and watersports, offered to children of all ages. A sumptuous Eid-Al-Fitr buffet will welcome families at Al Khiran Terrace on the second day of Eid, to mark the end of the Holy Month. Families will celebrate a blessed Eid Al Fitr around a grand buffet of Arabic and international specialties in a festive ambience. For families willing to experience summer at Al Bustan Palace, a summer package is available with an exclusive “Stay 3, Pay 2” offer, including three overnights in a luxurious room or suite, complimentary wifi, and exclusive savings on the hotel restaurants and spa treatments. spokesperson of the group said. The Asian Restaurant They have an offer of Ramadhan platter (1) plus two soups plus two fizzy drinks (OMR10). There is also an offer where diners can, during this Ramadhan enjoy healthy, nutritious, all you-can-eat Mongolian BBQ for OMR 4. It comes with a soup and drink. China Town Restaurant Executive Iftar platters with all of the favourite fried delights for two at OMR5.990 and for four at OMR11.990. Mainly juices and ice cream, including bottled fresh juices (1.5litres and 500ml); fruit platters (OMR6) Sidewalk Monthly health meal programme – includes Iftar, dinner, Suhoor with an extra snack (OMR99 only). Iftar buffet offer at Al Makan Seeb Al Makan Café, Seeb is offering a fantastic ‘break-the-fast’ offer during this Holy Month of Ramadan. “We are offering the right place with the perfect blend of delectable food and good vibes,” a spokesperson of Al Makan Café said. With the Holy Month of Ramadhan comes the season of offers in the market too: of brand new deals and offerings from almost every shop, department store, boutique, car outletsâ&#x20AC;Ś or on just about anything that is sold in the market! Car dealers are going to town with various special offers during the Holy Month to woo buyers. Shopping outlets, as usual, have offers galore and each one is vying with the other offering amazing deals. Let us also have a quick look at some of the exciting sales and offers that is out there at shopping malls and other outlets. The offers claim that the smart and discerning buyers are going to save loads of money on all items, from the smallest to the largest; from the cheapest to the most expensive; from the most common to the most exotic. It is all happening during the Holy Month. sporty, stylish yet sophisticated. One can also book a test drive sitting at home and get more details about any of Mazda models, using the Mazda Oman mobile app for Apple, Android and BB10,” the spokesperson adds. Offering the trendiest of Japanese cars, Mazda has brought in a lot of excitement in Oman's automobile industry with their 'stylish and insightful' branding. With a network of 13 service outlets and 10 parts outlets spread across Oman, TAC is the only Mazda distributor in the world to win the Mazda Customer Service award for five times in a row. With 98.2 per cent parts deliverability, TAC also offers quick, efficient service with genuine parts available for all models and have highly trained staff who pride in their quality of service. Call the CRM team on 92888005 or visit www. mazdaoman.com for details. Markaz Al Bahja’s exciting shopping offer The Markaz Al Bahja, Oman’s ethnic mall, takes on a spiritual hue during the Holy Month of Ramadhan. Being a well-known family shopping destination, the mall is on the forefront in having a variety of family-friendly activities. It also has an exciting shopping deal as part of the holy season. According to the mall management, any customer who spends OMR15 and more is entitled to coupons and automatically enters a draw. “There will be two draws conducted weekly on separate days and the winners stand to win OMR500 worth of Markaz Al Bahja gift vouchers.We will then pick a random customer from the draw box and he/she will win gift vouchers from nine participating tenants/sponsors,” a mall spokesperson said. “So we will have eight lucky winners for this Ramadhan, the spokesperson added. purchase with a real sense of value, together with a six-year total peace-of-mind ownership experience; especially so when combined with the power, reliability and performance that Mitsubishi vehicles are known for. This is why we are offering a combination of high-value cash gifts together with low down payments and even a trade-in bonuses of up to OMR500. Once the vehicle is purchased customers can enjoy up to six years of free service, unlimited mileage warranty and roadside assistance. Furthermore, in the spirit of the Holy Month, we will also be providing each customer with a special Ramadhan gift with every purchase. Additionally, for five weeks, with the first draw being held on June 6, anyone who test drives a Mitsubishi will be entered into a weekly draw with a chance to win a brand new iPhone 6S. Furthermore, any customer who visits the showroom during the holy month of Ramadhan will be entered into a separate weekly cash prize draw. For more information on the new Ramadhan offer or to book a test drive, customers can visit their local Mitsubishi showroom, go online to www.mitsubishioman. com or follow the brand on its ‘Mitsubishi Oman’ facebook page or twitter @mitsubishioman. full day from 12am. Customers can also check the daily surprise through USSD or social media. To find out more about Ooredoo Surprises or any of their inspiring offers, go to www.ooredoo.om/surprises or go along to one of their 41 stores and speak to one of their customer advisors. By Adarsh Madhavan I have my reasons to frown and I have my reasons to feel down and desperate. But, whenever I do, despite my need to wallow in self pity and despite the natural selfishness in me to think about only me and my problems, a sliver of a thought races to the thousands out there, here, and many other countries who have more reasons to frown; more reasons to feel down and desperate. I have problems, yes, I do. I have issues, yes, I do. I have inner pains and conflicts which cracks my smiles; which rains down on my parade. But nothing compares to the problems, the issues, the inner pains and conflicts that drowns the smiles of these poor souls out there who come to the Gulf, still believing in that dream. That dream that has indirectly propped up the economies of states in India, especially Kerala. Each and everyone of them who came here are like me. The only difference is that people like me and like my lot are officially termed as NRIs (Non Resident Indians). But, I doubt if that Indian maid is actually seen as an NRI; if that driver, if that street-cleaner; if that office boy; if that tailor; if that houseworker; if that construction or for that matter if any labourer is seen as an NRI. Are they NRIs? expansion programmes in the GCC region, Sajan confirmed that the next two years will witness a significant expansion of Danube Group in the GCC markets. Danube will also invest Dh50 million to open their first retail store in Qatar early next year. In Bahrain, Sajan said that they have established a building materials store as well as a retail store with a total investment of about Dh200 million. Sajan considers the UAE as Danube group’s headquarters and considered and the heart of their worldwide operations. To strengthen their business here, Danube will be opening two new retail stores this year, with an estimated investment of Dh50 million. Within less than one year Danube is planning to open seven retail stores4 in Oman, 1 in Qatar and 2 in the UAE with a total investment of more than Dhs200 million. The company will hire more than 400 employees and their total workforce would reach anywhere between 3000 and 3200.
of healthcare across the region in the coming months and years, which is why we continuously improve our services, with a focus on unrivalled patient-centered care,” he said. Elaborating on the ‘art of healing’ concept of Burjeel, Dr Pandey said: “At Burjeel, we strongly believe it is not just about the cure; about the equipment or about the facilities. Amidst all the medical advancements of the modern world, it is easy to forget that those who are sick sometimes need something more than medicines, treatment or sophisticated medical environment. Often a genuine warm smile, a reassuring touch or a few words of comfort can instill hope and confidence in patients and help them to get on faster path to recovery. This is what we mean by the ‘art of healing’. At Burjeel, we are of the firm belief that the process of healing is much more than curing a medical condition in a clinical environment. We provide an extremely comforting ambience, full of warmth and personalised attention. And this is the reason why along with world-class medical professionals, sophisticated diagnostic equipment and superior healthcare services, Burjeel Hospital is set to change the landscape of healthcare delivery in Oman.” Burjeel Hospital is a premium brand that is committed to offer the best healthcare services for their patients. The upcoming hospital in Al Khuwair will have all the core medical, paramedical, and support services supplied by welltrained, credentialed and accredited professionals. campaigns to promote Oman to the Thai people including online campaigns, and advertisements that are highly visible around Bangkok. It is our hope that our efforts will translate to more Thai visitors to Oman and more tourism revenue for the people of Oman”, said the Ceo. Apart from direct flights to Bangkok, AirAsia’s Fly-Thru transit service also allows passengers to easily fly to other cities in Thailand via Bangkok Don Mueang Airport. Fly-Thru destinations include Thailand’s world famous beaches in Krabi and Phuket and the beautiful northern cities of Chiang Mai and Chiang Rai. Passengers can checkthrough their baggage to the final destination, save time and enjoy a hassle-free transit experience. Oman, we believe that this forum will be of great benefit to all attendees.” “We are proud to be a part of this significant event, as we truly understand the importance of these forums and conferences in developing and enhancing the role of real estate in the growth of investments.” he added. exceptional ice creams made with meticulously selected ingredients. They are available in a varied range of classic and original flavours. “I am passionate about pastry and I love discovering new cultures and tastes, that is why in my pastry, as a Chef I try to use my skills that I developed with some of the best bakers and pastry Chefs in France at the service of innovation by creating new products with an Omani touch,” says Hermann Abdelatif Ferga, production manager, Pastry Chef and baker. “They include Omani halwa macaron, Luban Ice cream, Arabic coffee macaron, brioche with Omani honey and dates”, he added. The Manhattan Fish Market, an integral part of the Golden Spoon Group known for its exotic variety of seafood delicacies, has recently launched its new generation menu with 50 new additions of appetisers and entrees. In an evening of fun and food, the new menu was unveiled by Saad Al Balushi, managing director, Golden Spoon Group. “We are thrilled to introduce the new menu. At The Manhattan Fish Market, it is our constant endeavour to introduce new dishes keeping in mind the evolving preferences of the diners. We have added variety to ensure a delicious and exciting dining experience to our regular patrons while at the same time attracting new customers”, Saad said addressing the media. Majid Al Futtaim to boost total investment in Oman Majid Al Futtaim, recently announced it will increase its investment in Oman by OMR 515 million by 2020, reaffirming its long-standing commitment to the Sultanate. The company’s investment strategy includes Mall of Oman (estimated OMR 275 million), City Centre Sohar (estimated OMR 45 million), My City Centre Sur (estimated OMR 15 million), and additional investments from its retail, leisure and entertainment businesses (estimated OMR 180 million) including Magic Planet, Carrefour and VOX Cinemas. Majid Al Futtaim’s investments are anticipated to create more than 42,000 direct and indirect job opportunities in the Sultanate in the next five years. When it opens in 2020, Mall of Oman will be the largest integrated retail, leisure and entertainment destination in the Sultanate. The super-regional mall will feature 350 outlets in a 137,000 sqm retail space. It will feature ‘firsts’ including Oman’s largest snow-park, with an 8,000 sqm play area, and a Little Explorers edu-tainment centre. It will also include the Sultanate’s first Abercrombie & Fitch and largest VOX Cinemas and Magic Planet, the leading family entertainment centre in the region, as well as a 13,200 sqm Carrefour hypermarket and 292 room hotel, completing its integrated offer. needs of local communities. My City Centre Sur will include 16,500 sqm of retail space, comprising 50 outlets, a 6,850 sqm Carrefour hypermarket, Oman’s first City Centre Clinic and a Magic Planet. The project will create more than 3,500 direct and indirect job opportunities. “We have always been pioneering in the Omani market. We are proud to renew our commitment to be the leading GCC investor in the Sultanate through our OMR 705 million investments, which include the development of Mall of Oman, City Centre Sohar, and My City Centre Sur, as well as additional investments from our retail, leisure and entertainment businesses. We look forward to completing our projects and seeing them deliver more great moments for everyone, everyday,” said Alain Bejjani, chief executive officer of Majid Al Futtaim – Holding. Clive Hammond, Ceo, of Zawawi Trading Company, briefing the local media representatives at an informal gathering, to highlight the Mercedes Benz range. song Sixteen Tons, and the AfricanAmerican spiritual Soon-Ah Will Be Done. New Eco Centre opens at Shangri-La Barr Al Jissah Resort & Spa The hugely popular More Café have stepped up their food game in a big way with the launch of a new menu. Created by the café’s own international chefs, the new menu presents a healthy new breakfast selection, range of soups, salads, sandwiches and pasta dishes. Next to these, the new menu features wraps and new main courses as well as a mouth – watering burger selection, delicate desserts and refreshing new drinks. With many healthy new options such as the Berry Cobler with Quinoa, Spanish Tortilla, Seared Tuna with Lentil Salsa and Carrot Passionfruit Smoothie it is clear that the popular restaurant has not compromised on explosive flavors and taste. The foodies will be delighted with the new sliders, Teriyaki Burger with Wasabi Mayonnaise, Ravioli Shitake, Prawns Pasanda, Arabic Seafood Stew and many more! Ajit Singh, Group General Manager of Asha Enterprises, Believes More Café’s commitment to the highest standards of quality and its distinctive food gives it an advantage in Muscat’s highly competitive casual dining market. ‘’We are extremely pleased to be presenting our loyal customers with a new menu that will wow and tantalize taste buds. In the making of this new menu, there has been a clear understanding of incorporating local flavors that appeal to the Oman market. This fusion of Arabic, European and Asian flavours is what sets the new More menu apart and we are confident it will be a great success’’ Ajit Singh adds. Coinciding with World Turtle Day 2016, Shangri-La Barr Al Jissah Resort & Spa have officially opened their new Eco Centre recently with guest of honour Najeeb Al Rawas, undersecretary of Environment and Climate Affairs. The celebrations started with children from class KG3 of the Our Planet School in Madinat Qaboos arriving to have their own preview of the Eco Centre and were educated by Mohammed Al Hasani, the resorts dedicated Turtle Ranger, with a talk on the Turtle Care programme that Shangri-La Muscat undertakes. The children were also shown examples of turtle along the resorts Al Bandar beachfront. The official opening of the centre was attended by over 100 guests, which included not only Najeeb Al Rawas but also local residents, hotel guests, the children from Our Planet and representatives from the Environment Society of Oman (ESO) and Five Oceans Environmental. “The objective of the Eco-Centre is to encourage education into the conservation of the natural environment that surrounds us here in Muscat and to raise awareness of the extensive work that Shangri-La Barr Al Jissah Resort & Spa undertakes in order to protect the endangered sea turtles” explains Dirk Salzsieder, the resort’s resident manager and head of the CSR committee. He continues; “After six months of planning, gathering information and creating our concept we are thrilled to officially be opening the Eco Centre today. We hope that this area will provide a fun and exciting environment for both children and adults alike to learn more about Muscat’s environment”. The newly created educational centre, located above Mokha Café in Al Bandar hotel, is a dedicated area to explore and learn about the natural eco system in Oman as well as the extensive CSR activities and initiatives the resort is involved in. The centre will not only have a collection of information to read and view, but will also be the location of our daily 'Turtle Talk' and host of fun and engaging activities for children. Paris Gallery opens first store in Oman In the presence of His Excellency Sayyed Saud Bin Hilal Bin Hamad Al Busaidi, Minister of State and Governor of Muscat, Mohammed Abdul Rahim Al Fahim, CEO of Paris Gallery Group of Companies, and Mr. Salim Bin Abdullah Al Rawas, Chairman of Oman Luxury LLC, VIP guests and valued members of the media in Oman gathered at Opera Galleria to witness the grand opening and official inauguration of luxury retailer Paris Gallery’s much awaited franchise store in Muscat. The UAE-based retailer is in Oman to serve the unique needs of the luxury market and provide consumers with distinctive merchandise and superior customer service. The launch of the new opulent outlet reinforces the retailer’s strategic expansion plans in the region. Located at the Opera Galleria, Royal Opera House Muscat’s flagship shopping destination, the store is spread over 1,200 square meters of luxurious retail space and houses a vast array of international luxury brands in watches, perfumes, cosmetics, eyewear, accessories and leather goods. The retailer’s eye-catching retail concepts, impeccable service standards and traditional Arabic hospitality practices sees it stand out as an unequivocal shopping and gifting destination in the Middle East. “We are honored to have Paris Gallery in Oman at the exclusive and centrally located Opera Galleria. With Paris Gallery’s solid reputation and expertise in luxury retail and customer service, we will deliver the most unique, stateof-the-art retail experience in Oman. We look forward to accelerated growth through our on-going focus on luxury and service,” said Salim Bin Abdullah Al Rawas, Chairman of Oman Luxury LLC. Corporate Support, Khalfan Rashid Al Taley, DGM and Head of Central Operations, Mujahid Said Al Zadjali, DGM of IT and Alternate Channels, Salim Khamis Al Maskry, DGM & Head Sohar Islamic, Mazin Mahmood Al Raisi, Sr. AGM of Marketing and Customer Experience and Mustafa Mohammed Dhafaullah, Head of Alternate Channels; alongside other senior members of the Bank. with the lifestyles changing drastically with the advent of modernity ant technology. Caring and giving patterns also should evolve accordingly. Black & White team met with some key charity associations/NGOs in town who has taken up charity as a permanent feature of their day, throughout the year. Definitely, the spirit of giving is enhanced in the Holy Month of Ramadan and add on the generosity factor. CATCH THEM YOUNG The spirit of giving should be imbibed in the younger generation as they grow up. Charity and good behaviour starts at home, and should be trained in schools too. Let the young generation grow up with social responsibility and contribute their mite to the society they live in. Because charity is not a passing phase or a fashion title. Ali bin Shunoon bin Ibrahim Al Raisi beams with a certain beatitude; there is a look of utter peace and satisfaction writ on the glowing face of the executive chairman of the foremost charity organisation in the country. The reason is simple. In two decades since its formation, the Oman Charitable Organisation (OCO) is a formidable force to reckon with in the fight against poverty, destitution and disaster in Oman and beyond. orphans. Notably the volume of those requests and the assistance is increasing year after year, and with that, the number of beneficiaries and the amount of the expenditure continues to grow as well. “The organisation is sparing no efforts in providing aid and assistance to friendly countries, when they need it, inspired by the tolerant principles Oman believes in and demonstrated to us by Islam,” Ali Al Raisi said. The activities of the organisation within the country diversify and it grows year after year, as it works in every direction to draw smiles on the lips and light a candle in the way of life. “This programme aims at providing assistance to the needy individuals, to organisations, association and social centers as well as associations, bodies and social institutions operating in the field of humanitarian work within the sultanate. Through charity and aid offered by the people with kindness and generosity, we may all alleviate pain, or draw smile on the lips of the poor to light up the paths of their lives; this programme continues to go forward at a steady pace where thousands are benefiting from it every year.” The executive chairman of the OCO noted that their success story in reaching out to those in need was thanks to the Almighty and the unstinting support and follow up by His Majesty Sultan Qaboos bin Said. But, by no means were they resting on the laurels, he hastened to note. “There is a lot of work to be done. Of course, our dreams are bigger than our resources but we always keep our expectations high. Various methods will be explored to increase our resources through the income generated by investment,” he said. The true spirit of giving The Dar Al Ata’a Association’s (DAA) building in Al Bashaer road in Madinat Sultan Qaboos is a beehive of activity as usual. A line of cars are waiting to pass the DAA building as there seems to be a flurry of activity right before the premises and they were temporarily blocking the traffice. Not a murmur came from the patiently waiting car owners, who otherwise would create scenes. But, very few would not understand the significance of the unloading of goods before the DAA building. These were items of charity sent from various sources in the country and during the Holy Month, there would be more essentials being sent to the premium charity association in town, which would be distributed to the needy during the Holy Month. May Al Bayat, marketing director of Dar Al Atta’a Association was herself drowning in a sea of work. She was being inundated with calls, requests and volunteers were surrounding her as we reached the DAA office. Somehow she managed to squeeze some time for us from the hustle and bustle. “The Holy Month of Ramadhan ushers in the spirit of giving. As an association, we strive to be there at every step for the needy families and put in all our efforts to reach out to them throughout the Sultanate,” May Al Bayat told the Black & White. to donate. Some of the new locations include Oman Avenues Mall, Lulu Hypermarket (Seeb, Ma’awaleh and Bausher), The Sultan Center (Qurm and Azaiba), The Wholesale Centre (Al Khoudh and Amerat), Ramez Hypermarket (Seeb), Al Meera Hypermarket (Azaiba) and K M Hypermarket (Azaiba and Al Khuwair). Counters will also set up at fillings stations. Anything that helps people, even if it is a small thing makes me very happy. I am honoured to be a part of this campaign. requirement as available in the boxes,” Younis explained. EXHIBITION FOR EID CLOTHES Al Rahma also organisee an exhibition and sale of clothes and thereby raise funds for the needy. “We also offer Eid clothes to the needy families and orphans,” Younis said. IFTAR WITH THE OLD AGE HOME INMATES AT RUSTAQ “Our team of volunteers visit the old age homes, which house old people who have no one else to care for; we take care of them, spend time, offer them iftar breaks and Eid clothes, find out their necessities and do the needful,” he added. UMRAH TRIPS FOR ORPHANS The Rahma team also sponsors 20 to 30 orphans to make the Umrah trip to Saudi Arabia, all expenses taken care of. This is done annually. circumstances that are genuinely serious. However, far too often we add unnecessary stress, pressure, and negativity to situations with our attitude of “seriousness.” One of the best things we can do is laugh— at ourselves, at the situation, or in general. If worrying is unproductive and money doesn’t make us happy, why do we waste so much time on those things? You only get to live one life. If you’re lucky enough to make it to age 90 you still have less than 800,000 hours between the time you are born and the time you die to cherish and enjoy all the things that make up life. Finally, if you need a reminder that your problems aren’t as big as they seem and you want to readjust your perspective, get out of the city and look at the stars. The universe is larger than you can imagine. It is filled with burning balls of gas, galaxies and solar systems beyond counting, and thousands of other civilizations fighting their own wars and facing their own challenges. In a very real sense, you are insignificant. What better reason could there be not to take your life to seriously? The only thing that really matters is enjoying your life as much as you can and helping other people do the same. There is one fact that is undeniable: in this life, you will never be as young as you are right now. That being the case, do you really want to spend right now being serious? Life is an awesome adventure. Do what you need to do to live a happy and fulfilled life, and forget what anyone else tells you. it looked like the furious customer was about to beat the staff as his hand was also raised as he loudly ripped the pet shop staff apart. No one knew the reason but it was quite heartening to see the security staff quickly rushing to the scene the moment they were alerted. But before they reached to the shop, the customer gave them the slip. Whatever the reason behind the customer’s outburst, it did look quite ugly, but what was reassuring was the security personnel’s response: they rushed to the rescue of this shop official immediately. Of course they could not help alter the situation, but they just proved that they could be there when they are wanted. Do they serve those who “only stand and watch”? Come they said, come. Come for our swashbuckling event. Come and rub shoulders with glam gals and guys, they said. Vroom vroom, they said. You will be inspired, they said. It is going to be one big party and you are going to be dazzled by the glitz and the glamour! By the rock n roll! By the shine on the fenders and the imagination on the wheels… So great, said the media folks. Wow, they said. Time to don our tuxes; time to polish our shoes and time to comb our hair… Let us rub shoulders with the bold and the beautiful! we don’t know if they will also serve those “who only stand and watch”! Should we just stand and watch this shabby treatment of the media? Your artistic abilities come to the fore and you no longer feel the need to do what looks right, but you’ll be doing what feels right instead. New and improved avenues will be opening up in the workplace in a few days. Don’t cancel nights out with friends, as they are forecast to be just what the doctor ordered. Travel is well starred and you should find yourself visiting some new and exciting places over the course of the next seven days. Try not to have too strong an opinion on things you know nothing about or you could end up casting yourself in an immature light to the very faces you are trying to impress. Travel you make in the name of your career pays dividends and you start to aim higher and dream bigger. You will come on in leaps and bounds this year and things are going to continue to get brighter for you. Family prove tiring and stressful, but keep going as you are giving a close one great support. Finances come to the fore and you start to realise that you allowed to control your life and that you don’t have to bow down and do what everyone else wants all the time. A tired mind this weekend could see you cancelling the very events you needed to attend to get a moral boost. There are many rewards to be gained from working hard this week, but that may mean you having to give up some of your spare time in order to complete things. A clash with someone you used to have a lot in common with is bringing you down and it may be a case of you having to deal only with the person concerned. VIRGO August 24-September 23 Those born under the sign of Libra can help you succeed in business and financial affairs. Don’t be afraid to ask questions if you don’t know all the answers. It’s the only way you’re going to be able to fill in those important blanks. The departure of a familiar face leaves you feeling nostalgic for the past. MORGAN FREEMAN (BORN JUNE 1, 1937) is an American actor and narrator. Freeman won an Academy Award in 2005 for Best Supporting Actor with Million Dollar Baby (2004), and he has received Oscar nominations for his performances in Street Smart (1987), Driving Miss Daisy (1989), The Shawshank Redemption (1994) and Invictus (2009). He has also won a Golden Globe Award and a Screen Actors Guild Award. Freeman has appeared in many other box office hits, including Glory (1989), Robin Hood: Prince of Thieves (1991), Seven (1995), Deep Impact (1998), The Sum of All Fears (2002), Bruce Almighty (2003), The Dark Knight Trilogy, The Lego Movie (2014), and Lucy (2014). He is known for his distinctively smooth, deep voice. He got his break as part of the cast of the 1970s children's programme The Electric Company. Morgan Freeman is ranked as the 3rd highest box office star with over $4.316 billion total box office gross, an average of $74.4 million per film. stars LIBRA September 24-October 23 You could find yourself being taken advantage of if you are not careful this week. Try to be aware of what you are agreeing to, as many of the signs will be trying to get their own way, without considering what is best for you. The temptation to do something you shouldn’t in love could see you the talk of your inner circle. CAPRICORN December 23-January 20 There is a really strong air of excitement in the stars which is making it hard for you not to cast yourself as immature and giddy to those who are only just meeting you. Enjoy yourself and have fun Capricorn. You have needed to blow off some steam for days now. Business negotiations can go well. You will be able to see with clarity this week who is good for you and who has been dragging you down. You take steps to part ways with those who are a negative influence and you feel better and stronger for it. Don’t tell tales on those you work with midweek or it could come back on you tenfold. Someone who you thought was a good influence on you has shown a side to themselves which has left you with doubts as to whether they should be a part of your life at all! Go slow, as this time is set to reveal much about why they behaved as they did. Family make it hard for you to find all the time you want. AQUARIUS January 21-February 19 Family and close ones need your urgent attention for reasons which are going to mean a lot to both of you. It appears that you’ll be helping them move on from something which has, and continues to affect them. You’re playing the role of counsellor, and you do it very well. In fact you should be proud of yourself! PISCES February 20-March 20 There are several challenges which will all require your attention over the coming days but I am sure that you can achieve and succeed with each and every one of them. A good week to break bad habits and to begin a healthier life style. It’s sure to have a knock on effect on all areas of your life if you do. JAVIER HERNÁNDEZ BALCÁZAR (BORN 1 JUNE 1988) is a Mexican professional footballer who plays as a forward for German club Bayer Leverkusen and the Mexico national team. Hernández is commonly known by his nickname, Chicharito (Mexican Spanish: little pea), which he wears on his shirt. He began his career in 2006, playing for the Mexican club Guadalajara, before becoming the first Mexican player to join Manchester United in July 2010. After falling out of favour under managers David Moyes and Louis van Gaal, he spent the 2014–15 season on loan to Real Madrid, then moved permanently to Bundesliga club Bayer Leverkusen in August 2015. His minutes-per-goal ratio during his time with Manchester United is among the most prolific in the history of the Premier League. Hernández made his debut for Mexico in September 2009 in a match against Colombia. He has represented Mexico at the 2010 FIFA World Cup, the 2011 CONCACAF Gold Cup, the 2013 FIFA Confederations Cup, and the 2014 FIFA World Cup. He was the Gold Cup's top scorer with seven goals and was named the most valuable player of the tournament. Recent dietary guidelines advocate eating whole eggs, including yolk, are actually part of a healthy diet. And egg salads in its pure, natural state (meaning hard boiled eggs, a little salt and pepper) is 100 percent a-okay for all. Here are a few easy salads you can try at home. Simple egg salad Ingredients: 8 hard-cooked eggs, chopped 1/4 cup plain fat-free yogurt 1 tablespoon parsley flakes 1/4 teaspoon onion powder 1/4 teaspoon paprika 1/4 teaspoon salt Method: Mix chopped eggs, yogurt, parsley, onion powder, paprika, and salt together in a bowl. Method: Stir mayonnaise, green onion, mustard, salt, garlic powder, paprika, and black pepper together in a bowl until smooth; add eggs and gently mix to coat in the mayonnaise mixture. Salad without mayonnaise Ingredients: 1 tablespoon plain yogurt 2 teaspoons tahini 2 teaspoons zaâ&#x20AC;&#x2122;atar salt and ground black pepper to taste 1 tablespoon chopped pickle (optional) 4 hard-boiled eggs, peeled and coarsely chopped Method: Mix yogurt, tahini, zaâ&#x20AC;&#x2122;atar, salt, and pepper together in a bowl; fold in pickle. Gently stir eggs into tahini mixture. per day vs men 7000 tones of voices and what those tones mean”. Therefore, the better developed brains of females are genetically geared to “observe the subtle nuances of life from an inter-relational standpoint”. A case in point they would like to make is that “baby girls are fascinated by their parents’ faces and expression and are able to read expressions much sooner than boys”. At the same time, boys are slower at developing perfect hearing and are more drawn to the mobiles above their cribs than they are by their parents’ faces. Conclusion: boys are more drawn to things, while girls are more keen to interact on a personal level. So, what do these studies mean? In short, it tries to explain why women are able to keep to the audiences’ interest and how they can tell a story better and thereby become better communicators. What is filled in our body? Spirit? The little one was hardly eight years old, so it was an easy shot to answer, atleast I thought so when I heard the simple question. Should I go the scientific way or the spiritual, philosophical way? Na, the kid is too small to be loaded with both explanations; so I went in for the simple word. Soul. Spirit. My mistake. Sitting down one day to tell a story for my young nephew, I was at a loss of all logic explanations to the innocent questions he asked. You got to be very careful when you explain life, or even a harmless story to keep the little ones amused. Because the questions that are shot back at you spontaneously are not the ones you can survive answering with a smile or under the wrap of an adult. Soul? The little forehead was scrunched in deep thought. Quick retort back, like how you say mind, heart, feelings? No I say, it is the essence of your body, like an invisible power. Once again quick came the query: Like electricity? Well, something like that. Yes. We call it the soul. Soulful music, soulless world, lost souls, some are “old” souls and some look for a soul mate. All soul talk? Too heavy for an eight year old. Cutting it down to his level, I started off with the science, which he is very much interested in. Science says the human body is made up of certain particles, atoms, molecules that make up for energy. It is the energy that fills in your body. Mentally I patted myself, good answer. Pat came the next question… how many of them?